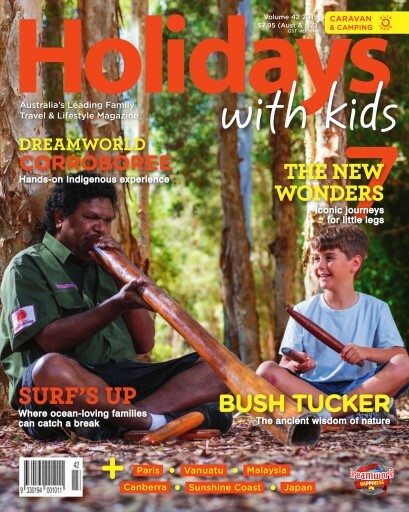 This issue of Holidays with Kids is our annual Caravan & Camping with Kids flip edition, so if you love getting outdoors with your family, you are certainly in luck as we’ve got 72 pages of inspiration. Within these pages you’ll uncover the results of this year’s Top 10 Holiday Park awards, which round up the best parks across all Aussie states as voted by you – our readers. You’ll also find camper trailer advice, fishing tips, family hikes and other travel inspiration. Our main side is also packed with domestic and international adventures – from animal friends in India and amazing surf destinations for all ages, to the wondrous modern wonders, a trip to LEGOLAND Malaysia, the latest news from the Gold Coast, and inspiration on how to ‘go bush’ and give your kids some memorable Indigenous or nature-based encounters.